Unclutter My Life, Day One. Going into the Closet. In an attempt to restore order in my life, and to clear this house of all the stuff we have accumulated over 30 odd years, I am reading this book. I know it will take me longer than 7 days. I have a six bedroom house. And the amount of stuff that is in it is overwhelming. I really did not know where to start. 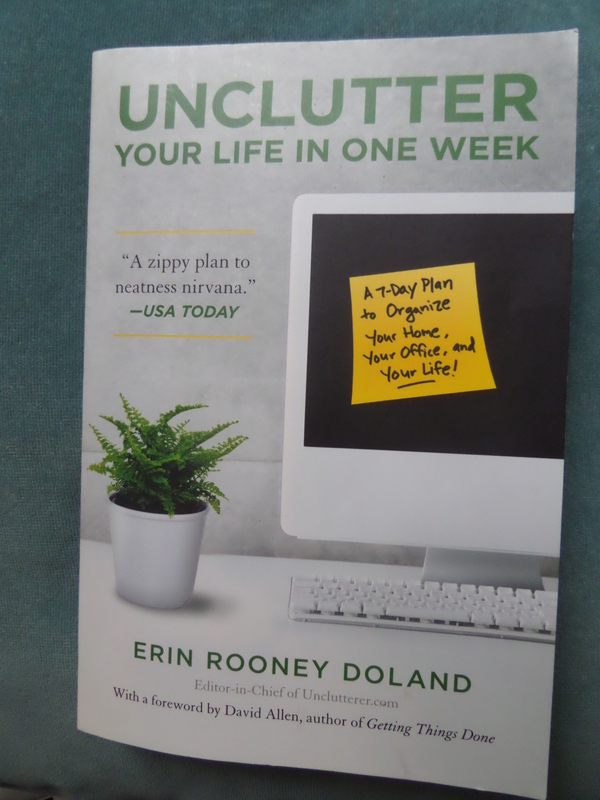 This book is helping me to tackle the clutter, as it deals with one area at a time. I tend to start one job then get distracted. Yet the tranformation from being a person who talked and blogged about needing to do this, to one that was doing it, came as a result of attending a life coaching workshop at Nettlefest, led by Lisa Cherry Beaumont. During the session I identfied that the area of my life I most wanted to make a change in was the clutter in my home.There are lots of other things about and in my life that I want and need to change and I listed all of them during the session. I could only choose one and I chose this particular topic because, as it impacted on so many other areas of my life, it would potentially make positive changes there too. It really helped that part of the process was writing an outcome statement and putting a date on it. As was visualising the impact that achieving the goal would have on my life. 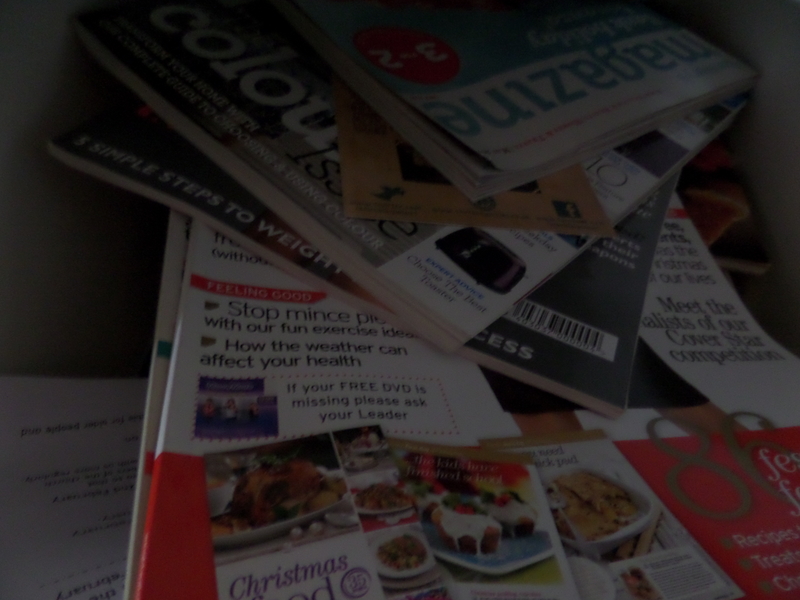 I am constantly reading articles about decluttering, and after reading 20 Things In Your Home you Need To Get Rid Of Now I recycled 100’s of magazines that have been gathering dust. Some date back to 2009. I am not sure a dentist surgery will take magazines that old. I have had this book for sometime, yet I am now more focussed on the goal as a result of the life coaching. The book is a tool to help me achieve that goal. 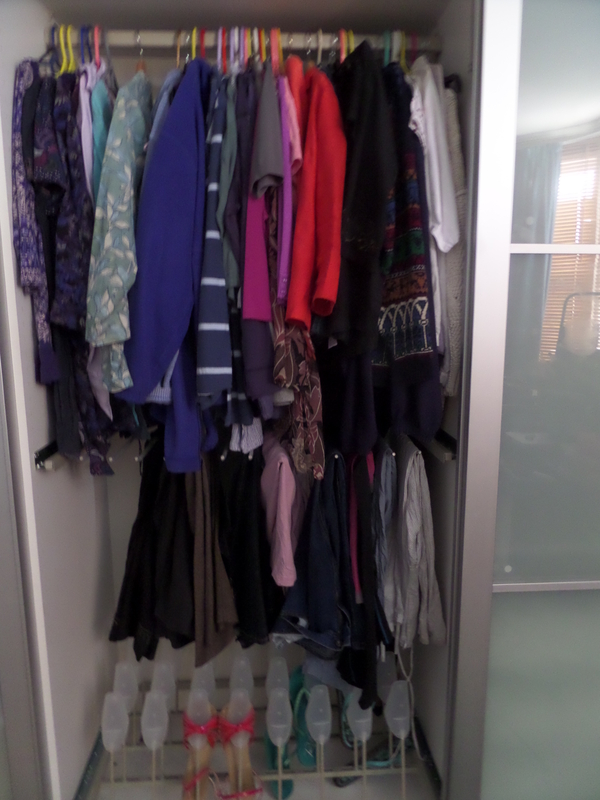 After reading Chapter 1, Foundations, and Chapter 2, Monday Morning, Your Wardrobe, on a sunny Thursday afternoon in the garden, I was inspired to get going on some closet clearing. In 30 minutes I achieved this. 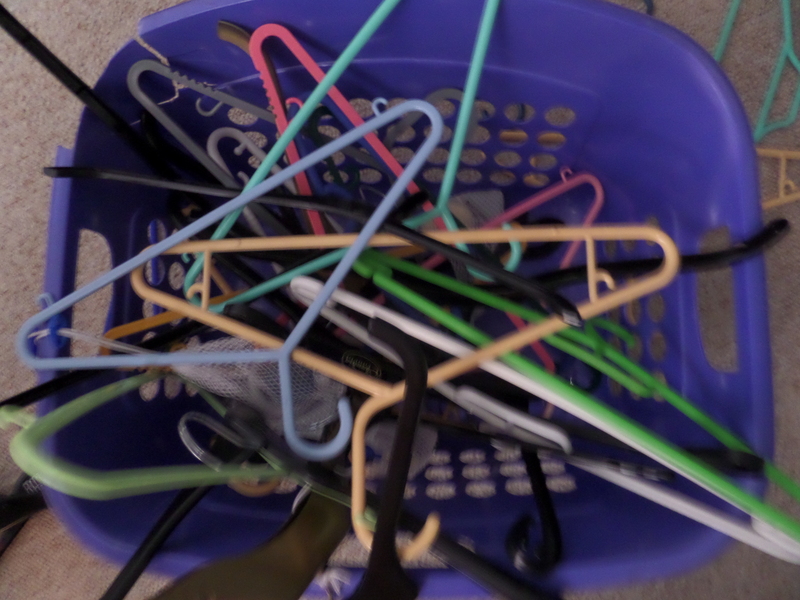 These are all the spare coathangers I have after weeding these out of the wardrobe. 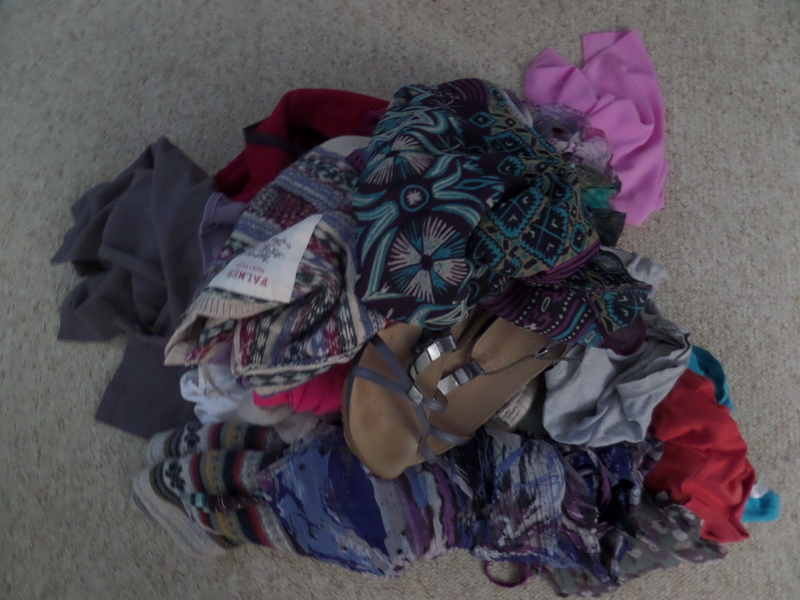 These clothes have now been donated to charity. The book is, I think, somewhat unrealistic. Chapter 1, Monday, implies that the closet could be sorted before you set off for work. The second section of Monday covers organising your desk and office at work. Monday evening, no flopping on the sofa with a chilled white wine, there is the Reception Station to be sorted. Yeah right, that’s going to happen. Not. Perhaps starting on a Thursday held me back. Yet I have made a start. I have a Goal. I have identified the Reality. Explored my Options. Identified my Way forward. I am going to GROW. This entry was posted in De cluttering, Health and Wellbeing and tagged Clothes, declutter, Life Coaching, Unclutter, Wardrobe by Travelling Coral. Bookmark the permalink. I try to clear at least one cupboard or drawer a week on a Sunday. Not much but better than nothing and as I have done this for a couple of months now I am more motivated to do a little bit more each week and when I haven’t cleared anything out one week I feel annoyed with myself. It is definitely easier to do it in small stints. Otherwise it can be overwhelming. That said it took 5 minutes to dump the magazines. With the internet there is no need for magazines or cook books. Now is a good time for this. Getting rid of things flows more easily under a waning moon – from full to new. As the moon shrinks, so does the amount of clutter. Good luck. I am happier doing a bit at a time and have it ongoing, but maybe I should do a *bigger* bit on the waning moon. Well I never knew that about the waning moon, yet it makes sense. And that is when I found the energy to do it. To be honest, 30 minutes a day, is doable, to do more would exhaust me emotionally as it is hard to let go of the ‘stuff’. Thanks Lisa and thankyou for sharing. Day two is now published. And yes, clear the closet on a Monday morning before work, that is never going to happen. She says set a short time slots for declutteirng because if the timer goes off and you still have the energy you can do a bit more, but if you set a long time slot and don’t manage it it becomes demoralising (well she says it better than that but that’s the gist!). She has some really helpful short videos as well as other helpful stuff like an extensive recycling list containing most of the objects you’ll find yourself wondering what to do with other than put in landfill.